Why will noone dare sort this massive corruption out? The “Preface” directly below, followed by the most recent updates from 24 – 17 May 18 from Carol Woods. 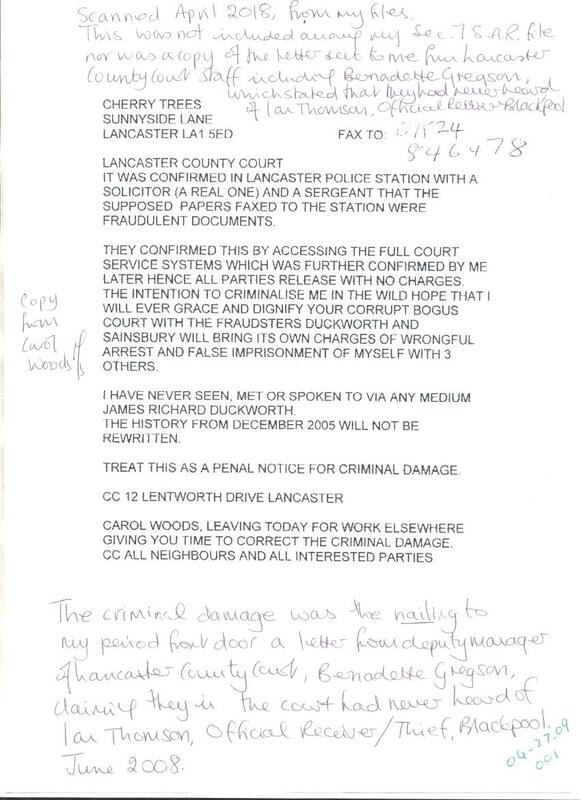 The posts detail the serious crime occurring to Carol, and connected to her, all totally ignored by authorities, including, it must be emphasised – the Lancashire police force, who have been notified so many times regarding the serious multi-ID frauds committed using Carol Woods name, in whichever guise or spelling, yet do nothing. 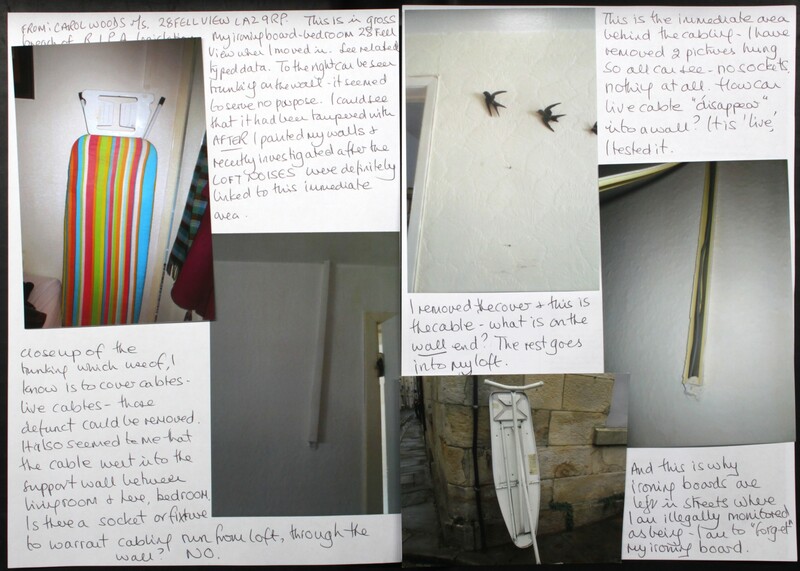 Numerous murder attempts have been attempted, which include trying to blow up the caravan she was living in by the culprit creating a gas leak into the caravan from the caravan’s internal gas pipes in an attempt to blow it up – along with Carol. This attempt obviously failed, but other equally serious murder attempts have occurred over the years, including local yobs ramming Carol’s car at speed on a dual carriageway close to Carol’s home. The monetary value of the ID frauds using Carol’s name, and variations of her name [“Carol” with an “e” added – as in “Carole Woods”, or a “Carol Woodes”, or even a “Mr. Carol Woods” etc.] must run now into hundreds of thousands of GB pounds – all at the UK taxpayers expense. 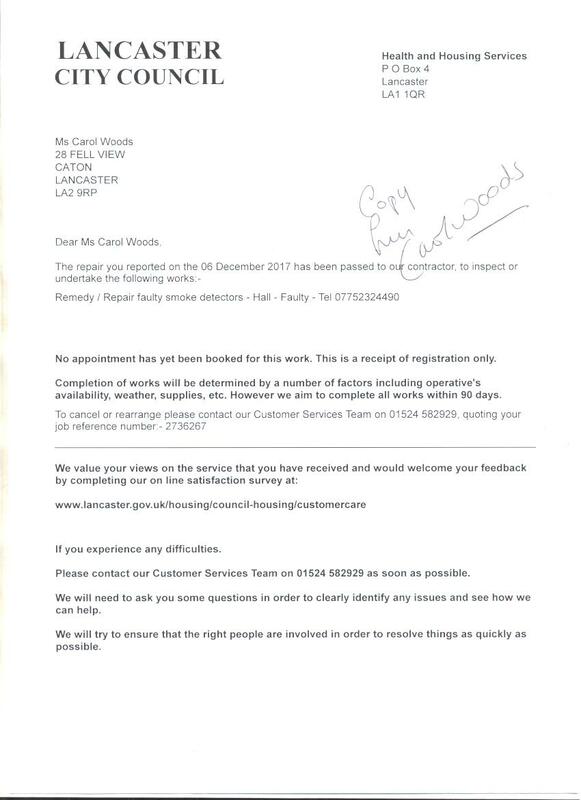 Carol Wood’s ID has been gleaned so many times from, it is very strongly alleged, deliberately misdelivered Royal Mail meant for Carol, misdelivered to criminal neighbours who, amongst other felons involved in the overall targeting, reap the illgotten gains of these ID frauds in one form or other – one form being receiving luxury goods, including cars. Cars are driven by local yobs when stalking Carol in her car [which has a GPS tracking device in it placed there by an Oldham garage under instructions from, it is very strongly alleged – Lancs. police. Please see the posts on this tracking device which manages to be exempt from Data Protection Act laws, and also E.C.H.R. Article 8 rules [the right to a “private and family life, his home and his correspondence”]. How many cars have been “given” to these criminals so as they can harass – and even attempt to kill – Carol when she has been out driving her car? The posts here, copied from Ms. Wood’s communications show the outrageous hostilities happening to her which continue very much to this day – the archive made of scores of posts beginning in Febuary 2016 after certain “supporters” found out Carol had been placed in a closed mental hospital unit for the 5th [at least] time for no honest reason. On January 31st Carol was arrested by Lancs. police for being myself – the owner of this site – for allegedly posting articles here – a nonsense charge easily contradicted by my affadavit / statement as sent to Lancs. police [the statement can be seen in the recent related post put here recently], but nevertheless this unwarranted arrest causing unnecessary hassle and more grief for Carol – the point of the exercise, I for one very strongly allege. Carol has been falsely convicted in the past on most fake of charges. to lep.newsdesk, news.london, look.north, secofstate, customerinvest., david.chapman2, insolvency.enq., me, bae146, info, chiefexecutive, chiefexecutive, contact, lotusprincess4u, michael.lockwo., sajid.javid.mp, privateoffice, farront, homeaffcom, graham.farrant, policing.minis., caroline.lucas., susan.acland-h., donald.toon, newcastlecentr. Before I, Ms Carol Woods send out this data I record that today 24 May 2018 the lunacy ALL filmed which included at least 3 local unemployed stood outside me in 28 Fell View LA2 9RP all using phones as pretence their phones were mine: I have been “swamped” with fat trolls with dyed red hair and rougher ones with dyed red hair; ALL using phones trying to creep along behind me and pretending they move house – as me. Driving from Fell View before using Lancaster town centre, the Masonic thugs were waiting in force, PINK SKIPS found out, SALFORD REMOVAL VAN, Royal Mail and the usual idiots in cars and I had just moved again. YOU pay for that FRAUD and HARASSMENT. Without going into all I will add that aside from photos of most I took photos of a sleazy solicitor found hiding in a white BMW, MA17 MVU (oddly it was black Audi’s last evening and they are all on film) parked on Copy Lane off Fell View outside a bungalow used via the seedy old troll who lives there which has been used before; she claims to be ME as MY DEAD MOTHER and sells MY house as “too disabled” to live there. EXACTLY the same was done using other seedy old fraudsters in Aug 2013 and Feb 2014 at least and also all on film. Remember only 3 days ago the lunacy was, in that, that I had just moved to 33 Copy Lane; the bungalow today again used is 27 I think. This to Law Society who know of corrupt solicitors and do nothing at all. That then set the harassment and FRAUD of today. Now I send this with attachments. Please feel free to quote me; this also had COUNCIL SLEAZY waiting to pretend she was also linked to me and a move so I have her photo as well. This data is sent amid events in which Lancashire Gestapo try to make NOW be 2008 and MY HOUSE events again. 7 Nov 2008 and I with a daughter and 2 of her decent friends were arrested for BURGLING MY OWN HOUSE, (the house which police officer Andrew Halliday and then officer Tracey Kennedy claimed as their own) which arrest saw gross breaches of PACE 1984 regs (reported and ignored) and I not spoken to in over 14 hours when I was released after the other 3 had been. (I have to add that the lunacy often includes having halfwits run up and down where I will see and pretend they run away from a burglary! I am to see and forget MY events.) Without going into all that I add this: prior to being released a common old woman, mutton dressed as lamb presented herself to me and my daughter in the cells claiming she was solicitor’s clerk PAMELA KERR. She handed me 4 “court” documents for which I thanked her and quoted the CRIMINAL ELEMENT of the County Court Act 1984 esp Sec 133, 135 and 136. (See attached.) The smirk went right of her silly face and she tried to take them all back from me but only managed to remove 2 from the 4. She did not remove any from my daughter. The Gestapo claim as this is the County Court Act then it is a civil matter! Later on 9 Nov 08 a bullying thug SGT PINDER rang me at my daughter’s house using her phone in regard to MY reporting the issuing of false court documents. PINDER shouted dis-joined drivel and I was sure he was manufacturing a call INTENDING to plant someone else’s voice as mine. (I have PROOF they have done that OFTEN on POLICE TAPES and COURT TAPES.) I ended the call. Since that was sent out more recently the council bullies and trolls continue to try to manufacture an “anti-social behaviour” matter saying that I shout. For example, this is done OFTEN using thieves and lowlife round Fell View who see me go to my car and shout at me, there are usually thieves MILLS in 20 and HUNTER in 22 with other lowlife who are to “witness” my shouting which they do not manage as I ignore them all. Naturally, anything I was said to shout would be “witnessed” and proof that I am anti-social which is a serious crime, apparently. In this the shouters are mostly JUNE BLENKINSHIP in 34 Fell View and her druggies entourage one of whom it is said is me and, JUNE WILLIAMS in 30 Fell View with her foul mouth who has ID IN MY NAME which has been related and reported so I do not repeat that here. In the usual Masonic inversion Williams’ shouting is to be MY shouting etc. Thus PINDER to be “revised” and a Sgt Pinder arrested me on 31 Jan 2018 for being a male from Bournemouth and posting on his web site. That Pinder did not seem to be the same inarticulate thug from Nov 08 and he denied knowing of any phone call with me. Nov 08 and the smirk had gone off the face of “KERR” who PINDER unwittingly admitted was in fact a DS DENT of MORPETH POLICE. I attach one document sent to Nick Hardwick then IPCC chairman who ignored it if in fact it was not kept from him by the usual gatekeeper type. I did have incident numbers allocated by Newcastle but then ALL emails and mail were blocked. 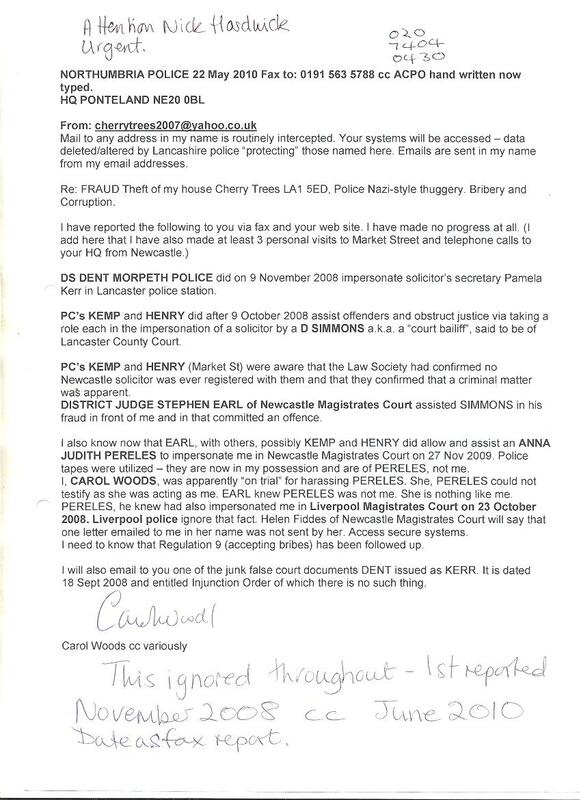 Please note my reference in that faxed letter to N Hardwick (another he ignored unless his mail to me was stolen) to a document issued to me dated 18 Sept 2008 which was the document seen by a REAL judge in the London High Court on 24 May 2010 when he was livid seeing that junk issued to me as REAL and an Injunction Order of which there is no such thing. He was the judge who instructed me to go home, forcibly remove anyone in MY house, sue them and prosecute them. Some know what happened when I tried to enlist Lancs police help in that. Those events are out of scope here: the Judge Justice Mackay ordered an inquiry into how such drivel could be produced AS IF FROM A COURT WITH A SEAL COPIED FROM OTHER DOCUMENTS AND ADDED TO MAKE ME THINK IT WAS A TRUE DOCUMENT. That inquiry meant I had to return to court in July 2010 and was why the Met police were lied to about me and why they made damn sure I was not “available” at all. I do not yet attach that document. (Please note how they claim Williams in 30 Fell View is me, that Dalton in 45 Fell View is me, that Jackson in 26 is me and that Jarvis in 41 is me along with others, they all want to be me). This is the background to the documents KERR did not manage to steal from me. Notice it says GIVE TO MISS WALSH that is my daughter and they dragged her into this as the bullying thugs they are which will ALL come out. I attach just the first page as the 2nd can follow showing even more EXTORTION and FRAUD. 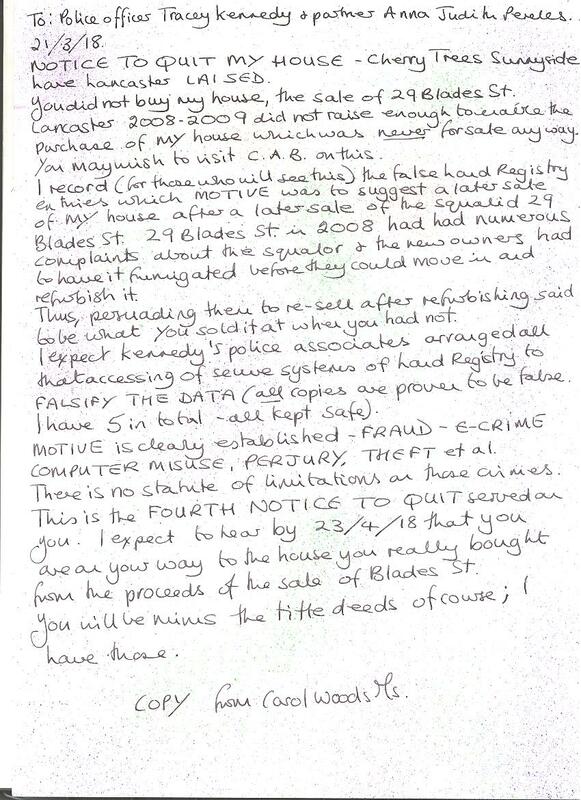 MIKE TODD GMP SAW THE EXTORTION ETC FROM 06 AND WAS WHY HE WAS MURDERED. And then notice the REAL COURT DOCUMENT which confirms the FRAUD which was to be covered up. I have redacted the person who accepted some mail for me so that it was not intercepted: if the Gestapo see his details even now they will offer reprisals as supporters have found to their cost. Please note, my Sec 7 Subject Access Request met after involvement with the ICO found that CHRIS COX MoJ had only obtained a file of rubbish from LCC and in that they have tried to delete ALL names of ALL except me. Earlier MoJ mail to me (years before 2016) confirms that there was no record of any hearing at all on the supposed date. It was not expected that I would have kept every single item showing EXTORTION FRAUD and worse. Oddly also, the Gestapo claim all those others are me yet do not have my daughter Ms Walsh. Dent was a liar and was aided and abetted in wasting police time: criminal offences SEEN and PROVEN, and the solicitors involved? Visited by me on more than 5 trips to Newcastle and ALL confirmed IN WRITING that they knew nothing about my case or my house and that they had never been in Lancaster County Court. DENT named to be prosecuted in my Attorney General file and consent granted July 2009. Please feel free to post these attachments if you have a web site. Attached is a fax to Lancaster County Court as I and my daughter showed a REAL police officer the junk issued to me; he checked his records with a local solicitor and they confirmed THEN that it was junk. They did nothing to help. Dear Sirs re ID201801889, Please note this AGAIN, it is those who have ALL claimed not only to be me but to claim they care for and drive me about in continual harassment. Today I ignored most of the harassment which was sent to take place of me as I had not gone out so, the harassment is sent to me in 28 Fell View LA2 9RP. I will not record those seedy agencies involved who are not council controlled. Thus the deranged in 24 (CURWEN who claims I live there as his wife in his fraud with his sister, pair of unemployed lowlife with literally tens of thousands gained and she now parks her car as if she is ME in 28) and WILLIAMS in 30 who have ALSO been given ID in MY name in the FRAUD where they ALL gain (all proof), and JARVIS from 41 opposite me who uses GN07 AHO and was caught using that when she worked as a cleaner at Lancaster University Sports Centre AS IF SHE WAS ME. She goes out in that car when she pretends to be me. Today then, she was out as me again but I had not gone out which I usually do. Thus by 3pm she was back at 41 Fell View and HIDING in the hedging between 39 and 41 which is a favourite hiding place of halfwits who ALL do such as this. I then leave 28 to walk to my car and Jarvis walks from hiding and PRETENDS she was me leaving 28! I am also sick and tired of the sleazy council trolls sending JUNK and MALICIOUS COMMUNICATIONS to me trying to make NOW be May 2008 again. What happened in May 2008? At MY HOUSE a white van BV06 driver kept parking up and alighting to stand about. No one knew who he was and a roughneck, not the usual in our area. He was apparently police ANDREW HALLIDAY and BY STANDING OUTSIDE MY HOUSE HE CLAIMED TO HAVE BOUGHT IT AND HE APPARENTLY EVICTED ME FOR RENT ARREARS AS I AGREED TO PAY RENT TO STAY IN MY HOUSE AND FORGOT I HAD SOLD IT SO FORGOT TO PAY THE RENT. The lunatics try to rewrite that now on council drivel sent as malicious communications and hope I “forget” the REAL events. This then to Graham Farrant at Land Registry. Naturally I have my title deeds, MY HOUSE has not been sold and Halliday’s name is nowhere at all on my deeds. There is no sale recorded whatsoever. PLEASE NOTE DESPITE MY HUNDREDS OF REQUESTS I CAN NOT BE GIVEN THE RANK AND BADGE NUMBER OF HALLIDAY. This also to DWP FRAUD as JARVIS and CURWEN et al ALL have claimed in FRAUD and GAINED MUCH. Not one single email over YEARS has EVER been responded to. Yours etc Carol Woods Ms 28 Fell View LA2 9RP. Aside from the usual halfwits who have nothing better to do that stand along a route and say when they see my car to then arrange the lowlife in the library (where it is assumed I am heading) so they can, in their delusions, pretend to be linked to me via social media nonsense, I add the BT fraud at 26 when BT installed a SECOND telephone link up as filmed via the rear of 26 as if she was 2 people and needed 2 lines. I attach the photos. Today Curwen another I have reported as being the deranged thief and fraudster as well, had ladders at 24 in the lunacy of hoping I would see and forget the BT fraud at 26 or, get the events “confused”. No one used the ladders at 24, they were placed by the walls, moved about, added to and then removed. 5/9/14 events were 5/9/14 events and were not rewritten today by the usual common purpose halfwits sent to parade to pretend. I have been copied the letter sent to a supporter re the ILLEGAL GPS on MY car which permission I gave him to ask about it. He was referred to the IPT, why bother? I’ve done all that and your thugs told them in 2006 that they had never heard of me and that I did not live in MY house. They told the IPT that I was my sister living in Shaw which was odd, they had never heard of me but knew who my sister was and where she lived! Then of course with your gatekeepers (the silly women in reception for most agencies who act on instruction) it is a waste of time going to the IPT which YOU know. Incidentally STOP CUTTING OFF MY WATER SUPPLY AS YOU DID 10 MAY 2018 AND AGAIN YESTERDAY. Dear Sirs this is classic revision history harassment and thuggery Lancashire. I am Ms Carol Woods under duress at 28 Fell View LA2 9RP where the lunatics claim I am in at least 24 houses including those on adjoining streets. Without going into all that, this is the “NOW” from 2010. May 20th 2010 I rented at 52 Adderley Rd Harrow Weald, MY house in Lancaster stolen wrecked and looted 27 Oct 2008 and 19 Nov 08. On 20th May 2010 an IAN TAYLOR FORREST was to be in the High Court London for his case: a man I never met (oddly today I see I have an email from a man I have never met or heard of with a name not far removed from that of Mr Taylor-Forrest so it reminded me to add this detail), the document from his case was relevant. How to stop me going to court and finding out what I suspected was FACT? My landlord Z SKIBA, recruited quisiling, was told to ask me to stay indoors all day and wait for BT so they could have an extra line added. I was told he would be in and out before 10 am so I agreed. By 2pm no one had called so I left a note on the door and went out but it was too late to go to the court then. BT was outside on the floor connecting what they needed from outside saying they had not needed to be inside at all. I had not seen from my room and he had not rung the bell: I had no idea he was there. I went to check the Internet and found MR Taylor-Forrest’s case on the Internet, and then checked his document (after I printed it off) with one I had been issued with as if HIS case was MINE. 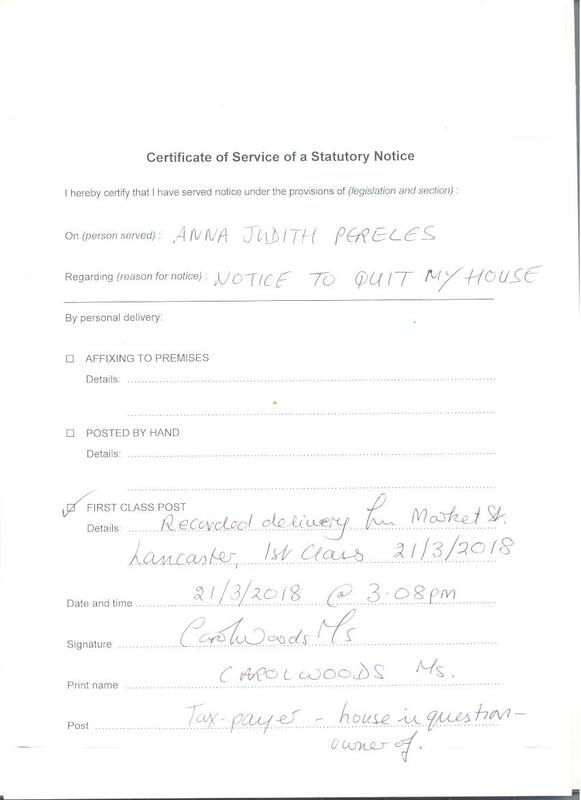 The lunatic in residence of Lancashire police and legal rep for the county IAN YOUNG had printed off the case and used that document to then alter the details, add MY name and that of a daughter of mine and issue to me as a TRUE court document from Lancaster County Court. It was junk which I was sure of, and sure enough, Mr Taylor-Forrest’s case on the internet had given him the idea. I found that by sheer chance; I had received some assistance from one who is now deceased so they can’t touch him. I printed off MrForrest’s papers COMPLETE WITH COURT SEAL by then and on 24 May 2010 took that and the junk I had been issued with to the High Court where staff were appalled at seeing the junk issued to me as TRUE. They insisted finally that a judge had to see it and know. I was granted an emergency hearing and Justice Mackay was livid at seeing the junk I was issued with and the Forrest case on the Internet with court seal ready for any to print off and use. The lunatic YOUNG did this in 2003 with an appeal of mine and which is kept safe; that “decision document” thus ended with 3 THREE court dates and 2 different seals as YOUNG forgot then to delete the original court seal on that case. Those in the High Court on that appeal of 2004 saw that and did nothing with then led to much else in Jan and Feb 2004. Those are kept safe as well. Young has clearly done this as ROUTINE for YEARS on many cases. Pity that the Judge then 2004 seeing that decided to ignore it and hope I went away: he was Lord Justice Peter Gibson; corrupt. On 24 May 2010 Justice Mackay, livid at the junk issued to me, ordered an inquiry into how such junk could a) be printed off the Internet, b) details altered c) then given a bogus court seal from another court d) issued to one as if it was a REAL court document. There was no such thing as an INJUNCTION ORDER which the junk I have claims to be: it is utter drivel and typical of the lunatic YOUNG who can’t get anything right. The “court” seal from Lancaster added is an ancient seal used of THE KING’S CROWN where the sleazy manager STEPHEN SAINSBURY sat printing his drivel for YEARS to issue to people cheated out of homes, land, children and so forth. Mr Forrest was in the High Court 20 May 2010 on his appeal for the Injunction he had issued to him. On 24 May 2010 Justice Mackay told me to go home, forcibly remove anyone in my house, sue them and prosecute them. Firstly, I was to return within days to answer questions about the false court document and OTHERS I told him I had and, to get the document instructing me to forcibly remove anyone from MY house. The thugs had other ideas, harassment from the Met then with Paul Stephenson Freemason from Lancashire promoted as deputy Commissioner then Commissioner, so he put a stop to all from 2004 which had gained headway for me from the Met in regard to such as Gibson.. I was hounded and harassed, arrested and released in farces, then arrested again as if I was someone else, 2 bogus bank accounts had been found by me in HSBC Strand London to have me charged with undeclared income, and so on. I was finally dumped in a mental hospital, not told where I was and that went on to Sept 2010, then I was hounded with attempts to steal the hospital document which records I am not mentally ill and have no medication at all. By Nov 2010 I had tried Lancaster police for help with MY house when they after 4 and half hours messing me about arrested me as being a likely terrorist with bombs in my suitcases. I was a door to door salesman of dynamite – possibly. Anyone can ask where all that led. Out of scope here; I limit this to 20 May 2010 to 24 May 2010. Attached: Notice to POLICE OFFICER TRACEY KENNEDY AND PARTNER PERELES WHO BOTH POSE AS ME IN COURTS AND ANYWHERE THEY THINK THEY CAN GAIN. Later this week I will send out photos if anyone wishes. 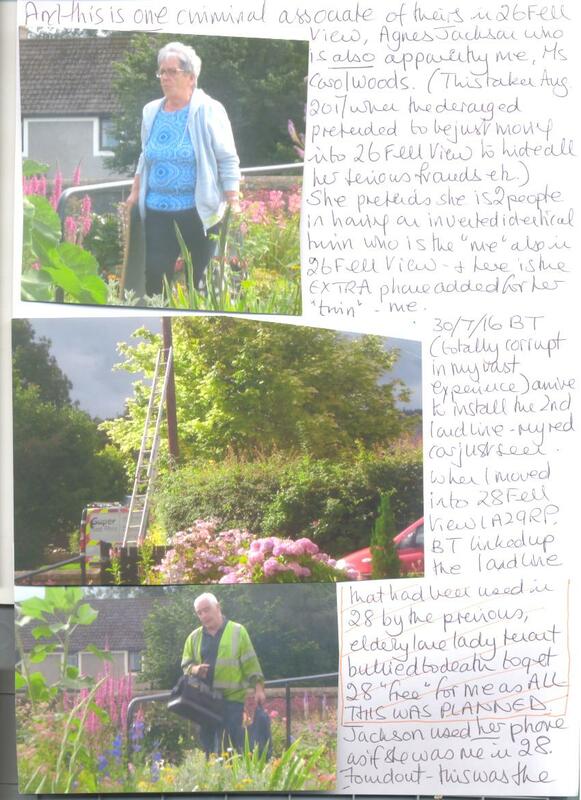 Dear Sirs Attached is a page showing an old white haired woman sneaking through my rear garden at 28 Fell View LA2 9RP and she is apparently me. The Gestapo drive off when they see me with my camera. Thus Jackson recruited ready for my move to 28 Fell View on 24/3/14 (which they will try to make 24 May 2018 now after I apparently moved again today with Gestapo “seeing” a removal van which is apparently PROOF I have just moved yet again) has gained hugely. A malicious old parasite and usually in cahoots with June F Williams in 30 Fell View who also is used to be me. Williams the same type as Jackson but Williams married to MR Williams where they have ID as MR and Mrs CARL WOODS to make them also me. How does Jackson “be seen” as being 2 people and “identical”? Aside from 5 old trolls sent to be her “identical twin” which were all different and nothing really like her with Lancs Gestapo not understanding what “twin” means (they sent for 5 mins and never call again), this is the most used FRAUD. Jackson leaves the front on 26 in one outfit or one distinct jacket. She walks round the block and sneaks back into 26 via her rear door after 10 mins or so and then emerges in another jacket or outfit (depends on the weather). Thus she is seen leaving as 2 people (as she thinks) which is PROOF one is me Carol Woods or Carol Jackson her “twin”. To aid her WILLIAMS in 30 wait and then make noise so that it is a distraction for me and to cover any Jackson might make sneaking through my garden. But Jackson has a “routine” which is to show me she is out thus the 2nd one leaving has to be her twin, she slams her front door and crashes and bangs the front gate, “Look, I am out” and the sneaks back in. Here I just caught her sneaking back in at the rear 10 mins after she went out in the same noisy way. FRAUD and PLANNED WITH INTENT from March 2014. 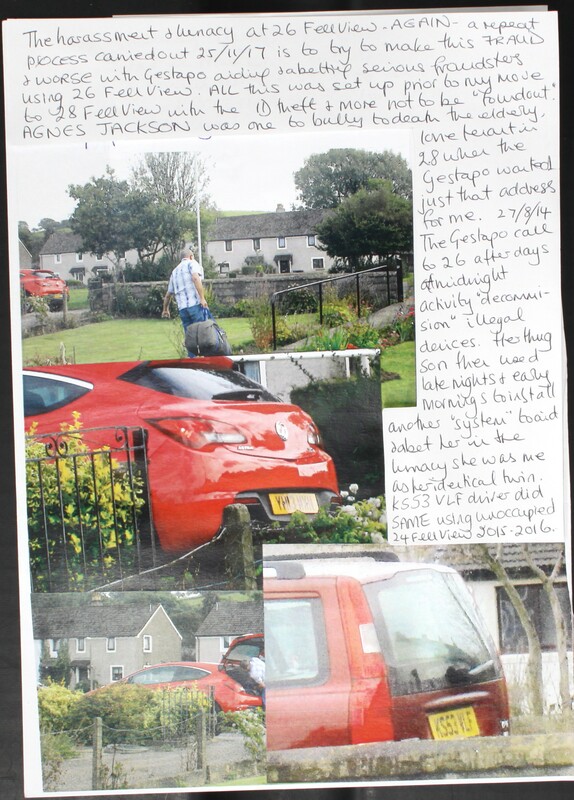 The other pages show the lunacy with cars as I am apparently not there as me with my car; Jackson has claimed to be me and “too disabled” to drive so I have to be someone else and made to think that I do not have my car; they refer to it as “brainwashing”, I refer to it as lunacy. My car window smashed deliberately Xmas 2017 to make me claim on my insurance with WILLIAMS sent to stand about and be seen in Lancaster and thus she had claimed on insurance and was me. I did not claim. That FRAUD and ID THEFT failing, the Gestapo found a pair of unemployed lowlife who had been used previously but at 22 and 24 Fell View as I also live there as well being cared for and driven about by those thieves and worse. 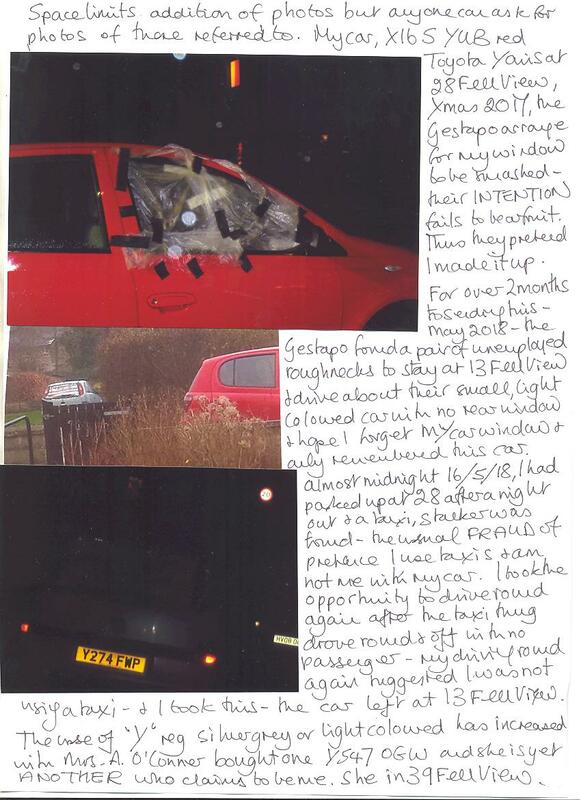 Their car by March had had the rear window smashed and they were sent to stay in 13 Fell View and drive round and round to make me see and forget MY car window. It would be illegal for me of course to drive without the rear view but they unemployed lowlife are above the law as all are round Fell View except me of course. For me, laws are invented and I can easily break them – apparently. 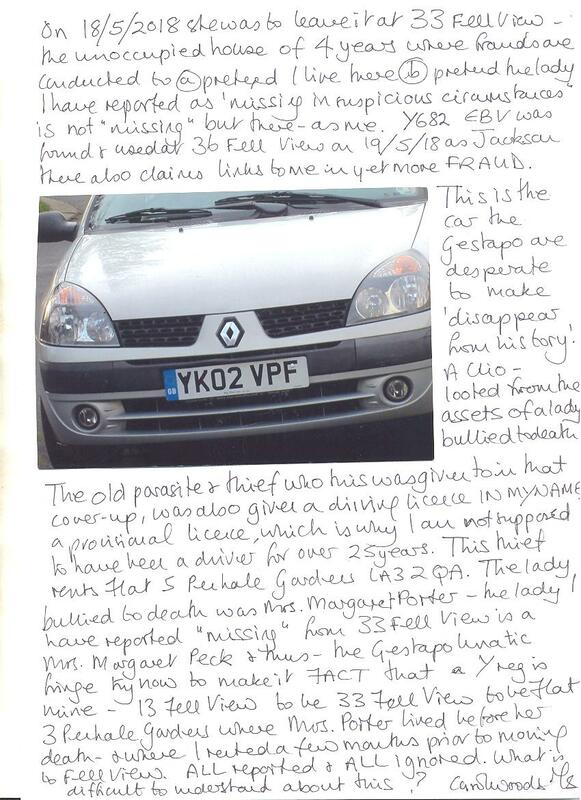 The car was Y274 FWP and used amid many other Y reg cars all in the same period and they have to be Y reg. When I rented Flat 3 Penhale Gardens LA3 2QA (which is why all with a 3 in the house number are used) I found that an old parasite in Flat 5 was used to be with a provisional licence IN MY NAME. I did not know who she was. She used this car YK02 VPF which I found was LOOTED from the previous tenant of Flat 3 an elderly lone lady bullied to death a Mrs Margaret Porter. Her assets were looted, no court was appointed to oversee the death etc. Thus the old parasite in Flat 5 claimed to be me in flat 3 and apparently I “inherited” the car as Mrs Porter’s daughter when she did not have one. It took me from July 2013 to mid Nov 2013 to find all that out and proof I have, more than any jury will need. But since this car YK02 VPF is a serious issue then the Gestapo waste YOUR monies in tracking down lowlife who do drive, are available as unemployed, all round Fell View are easy recruits as ALL have gained much (as those in the 24 flats gained) and who will live with strangers when told to. What is in it for them? 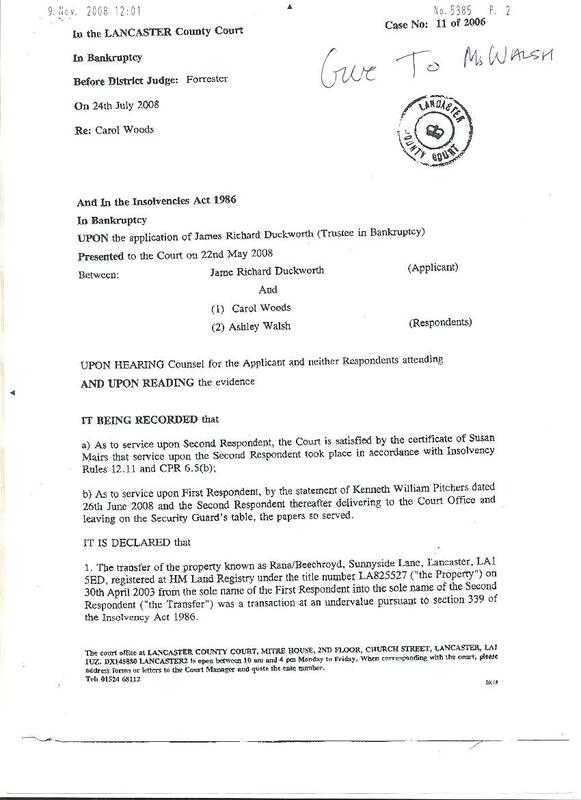 Thus Y reg was found for O’Conner in 39 as she also claims to be me,Y547 OGW and so it goes on and ALL to cover for the LOOTER of the dead in Flat 5 Penhale Gardens and what that exposed will reveal. What happened to the lady from 33 Fell View? Mrs MARGARET PECK, not there for over 4 years now (since I moved to 28) and we have another suspicious missing elderly lone lady who I have reported as missing in suspicious circumstances. 33 Fell View is ANOTHER unoccupied house used in lunacy of pretending I do live there. Am I also Mrs Peck as well as Mrs Porter? MOnday I saw an old doxy sneaking from hiding as I drove from 28 Fell View in my car which is not imaginary, and she went to another unoccupied house which I filmed: 33 Copy Lane off Fell View and one I thought was being used for some time, so, I also apparently live there as well. She was no one I knew but the pretence will be that she sees to my moving in there as well. Ends Carol Woods Ms This I could not send on 21/5/18 as the Gestapo blocked me from adding my photos. They had a “plan” to “see me off” AGAIN which was? back at Hell View 2 thieves and fraudsters O’Conner from 39 and Margaret Dalton from 45 sat on a wall to be “witnesses” to my SEEN at 28. Jarvis who also has ID for use when she is “me” from 41 had hidden her car. Williams in 30 had hidden their car (registered to ME as if they are ME) so it looked like they were also out when they hid indoors. 30 bungalow opened a rear window most convenient for a “burglar” with Jarvis watching from their upper floor (only 26/28/30/32 are bungalows, the rest are houses) PLUS Dalton and O’Conner. The lunatics hoped I would try to enter 30 and be caught burgling (that is the point of them hiding indoors – to catch me “red-handed”). Why did they think that? They hoped to rewrite an event from years ago in my book which ILLEGALLY they have the draft versions of and thus base ALL on MY details in my book to make them new events and “now”. From Ms Carol Woods under duress at 28 Fell View LA2 9RP. This is more found out in Lancashire and why certain firms are used. Yet again it is ALL in relation to MY case and MY data stolen which is for my books. I have recently complained about a firm ATLAS which appeared in Lancaster not long ago and found their vans constantly hiding in country lanes which then stalked me as my car passed. I reported to their head office when I found in small lettering who they were, I knew that they were used in the masonic thuggery of harassment to brainwash me. ATLAS REMOVALS in Morecambe LOOTERS of MY house with council staff were to be “swapped” in my memory for this new firm ATLAS. The staff in HO told me crimes were being committed which I knew but then they did nothing. I took photos of the vans when stalking me and wondered why they hid parked in country lanes if they were on bona fide work. Nothing then was done and they carried on harassing. I do not forget ATLAS REMOVALS, their Director SANDRA MICHEALS is named to be prosecuted in my Attorney General file which consent to continue was granted in 2009 and why other things happened to me. That is out of scope of this. 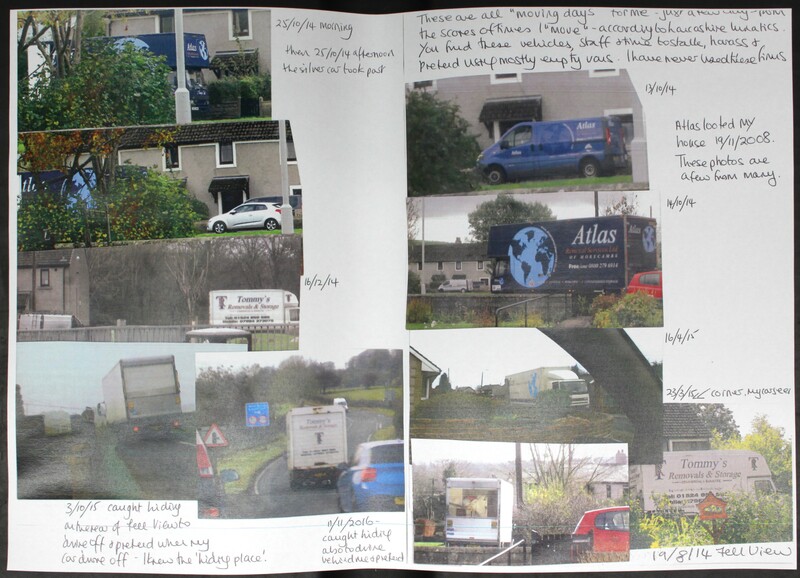 The new ATLAS vans, I found, are linked to Blackpool and the NHS and their harassment was in the lunacy of pretending as they stalked me from Caton LA2 9RP about 6 miles out of Lancaster and then they went to an NHS storage depot that they were somehow linking me to NHS which the Gestapo are desperate to do to claim I am “too ill” or “too disabled” to live in my house. THEY WANT TO CLAIM I SOLD IT FOR THAT REASON AND THAT IT WAS NOT STOLEN WRECKED AND LOOTED IN EXTORTION, DEMAND MONEY WITH MENACES, FRAUD, ID THEFT ETC. The ulterior motive is to hide the murder of MIKE TODD GMP as he was prosecuting those I ended by pursuing myself after he was murdered. Many know of the sleaze and corruption I have cogent evidence of in regard to NHS and what others also have. But then another small ATLAS van passed me today, not a stalker, and his van had extra lettering which now makes more sense. This I was not informed of in my first report. 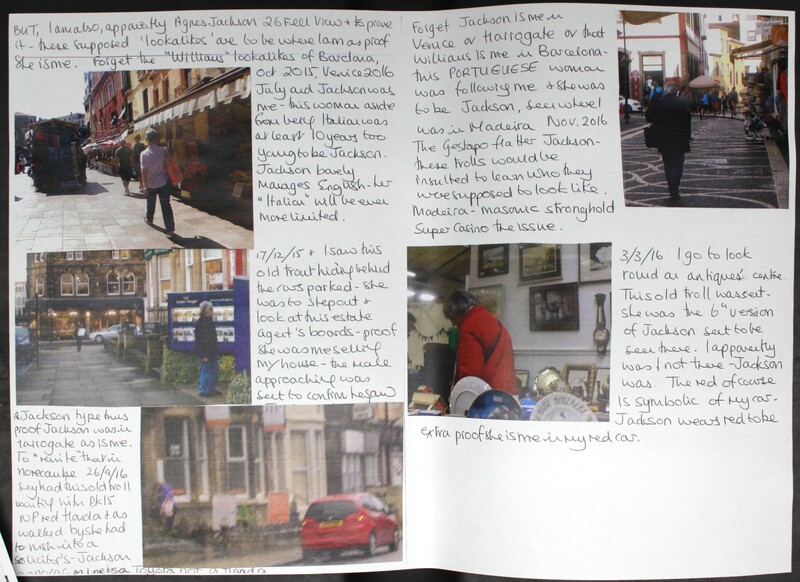 The Blackpool issue is so that the Gestapo can claim I am from Blackpool yet again when I am not and never have been. ATLAS in Lancaster from Blackpool are MAINTENANCE AND BUILDING agents. What has that got to do with me and my case? IAN McCRIRRICK AND MIKE JENNINGS of Kemple View Secure Hospital where I worked in 07 as Education Facilitator. The Gestapo had to spoil that for me as they spoiled every job I had after leaving social services after blowing the whistle in 2001. They needed to discredit me to discredit what I said, thus having a good job spoiled their “plan”. By 07 I was fatalistic about being forced out yet again, but I was told at the last minute, when I handed in my resignation that Jennings had received a phone call from someone unnamed who could have been Mickey Mouse, saying that I claimed DWP benefits as well as my full time wage. No one asked me for the FACTS, they believed it which was when staff’s attitude changed towards me and I had no alternative; at that time I had reported to Lancs Gestapo that DWP mail for me showed ID THEFT and my tax records moved for no reason (nothing to do with my job then) HMRC HQ in London me was the usual first sign of ID theft. The DWP letters I left in Lancaster police station “disappeared” overnight and CHRIS AIREY wrote saying they had had a full investigation and found nothing. Thus the DWP letter that accepts my reason for not attending a medical and offers me another appointment to ensure I keep receiving benefits. What were they talking about? Airey couldn’t investigate what is under the skin of a rice pudding. In 2012 they decided to tell me that as I knew the DWP letters were bogus then there was no problem! That ended my work with Kemple View BUT the sinister motive in ALL that, was to claim I was a patient and not a member of staff (anyone can see my pay slips and work records if they wish) thus IAN McCRIRRICK then wrote me 3 months later and tried to lure me into a trap of a “meeting” but not the site of my work, another secure hospital. I had never heard of him, he was nothing to do with Personnel or my dept so I made enquiries; HE WAS A BUILDING MAINTENANCE WORKER. It had been a trap but it failed as I did not attend the meeting. I hope someone recalls the “arrest” (farce) of me 7/11/15 when it was decided I was mentally ill and only claimed to have the jobs I said I had had? The INTENTION was to claim AGAIN that I had been a patient in Kemple View. This ATLAS now is to mesh all that, shake the kaleidoscope and bingo, the deranged have a “new idea” to harass and “brainwash” me. Ends Carol Woods Ms. Please feel free to quote me. 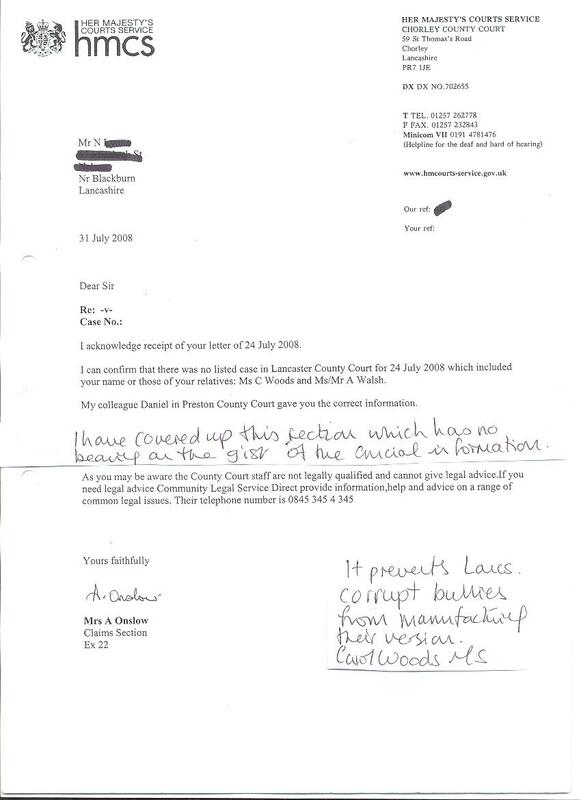 Dear Sirs, Earlier I Ms Carol Woods sent out to Lancs Gestapo events they ARRANGED in COLLECTIVE HARASSMENT of me yet again trying to make NOW be earlier dates and earlier years. They did not appreciate my email which records MY COMPLAINT as to use at tax-payers’ expense of lowlife sent to harass me and the usual FRAUD of standing behind my car or where the individual thinks I won’t see, (photo of one such stalker to be sent out this week as I found him via the shadow he cast while he was using his phone and pretending as he was behind me then it was my use) and then walk off as I drive off as apparently I have ended the call those deranged make. The NEW IDEA followed after I made my formal complaint to Gestapo HQ which will be ignored, photos offered and cars used in stalking to harass plates given so they have no excuse: At 3 26pm I was stood waiting to cross a road and saw MORE Gestapo sitting and waiting for something but what? They ALWAYS sit to confirm their FRAUDS and claim it is ME they see. He slowly pulled away and a male in scruffy black rushed over and posted in a letter box which I was stood near to although on the other side of the road. This is the POSTING FRAUD which goes on and on and allows for all the ID theft, false bank accounts and so forth IN MY NAME. Thus the thug was to wait until instructed and oddly he had passed the main post office to be where I was, why not post there? Because I had not walked that route. The Gestapo then confirm they saw me near the post box thus I had posted something. In Lancs 2+ 2 = 5 every time. The male I noticed then went to Nat West Bank which is a bank used in FRAUD IN MY NAME by a Pat Jackson of 8 DeVitre St Lancaster, she is ONE from many used to be me. She is not related to the thief and worse in 26 Fell View LA2 9RP AGNES JACKSON who is also apparently me as her identical twin! She claims to be 2 people, herself and me. On 22 May 2015 a local unemployed yob also called JACKSON but not related to others of the name in this, he from 36 Fell View stood outside me in 28 and used his phone for texting: he pretended to send messages to me which were to be said for AJ in 26. He has dark hair: Jackson is white haired now but was obviously dark, I am strawberry blonde so could never have a son with dark hair. The yob (still unemployed so that is at least 4 years now as I moved to 28 Fell View on 24/3/14 and 99.9% are long term unemployed and get away with it!) 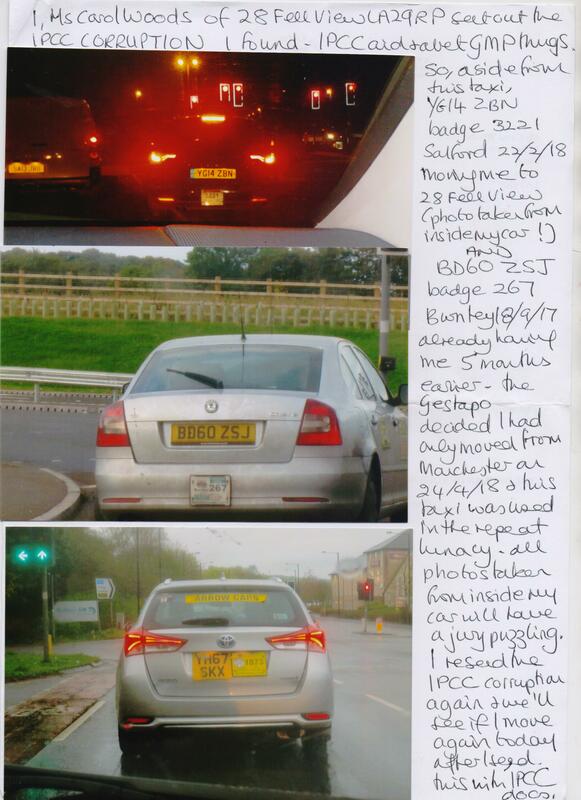 On 23 May 2015 Jackson sneaked from 26 Fell View AS ME and was picked up by another lowlife unemployed used a lot to drive Jackson about as she does not drive; even when posing as me she does not drive! BK53 EWE was one car used and Y191 SLF another and both used from 31 Fell View. I saw the FRAUD in INTENT to pose as me so went out and found the yob with his head shaved waiting for the bus to Lancaster. They were to attend a DWP medical with A Jackson posing as me “ill” and the yob posing as her son MR CAROL WOODS to make her Mrs C WOODS. I took photos and went out myself so was on CCTV elsewhere; that spoiled that. The INTENTION is to do that AGAIN and now Jackson I guarantee will claim to be “ill” yet when she conspires and colludes with others out of sight she is not ill at all. Thus the male today will have posted something to suggest I make a claim, given the link to his bank visit (rapid) I have to think it is DWP again. It is also ANOTHER ACT OF LUNACY IN PRETENDING I AM MOVING ON 24 MAY 2018 AND HAD NOT MOVED ON 24 MARCH 2014. It will be a NEW CLAIM and DWP know yet do nothing at all. 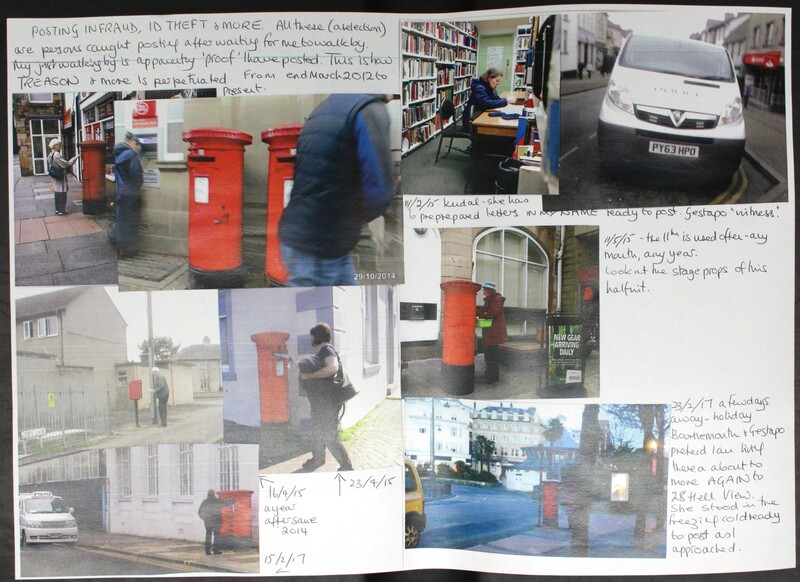 I add photos of posting, I have not developed and scanned the ones of today, but as “same old same old” it can be seen how often this is done: I have scores of such fraudsters, TREASON with Royal Mail taking part, caught red handed yet ignored. Photos of the yob available from 22/5/15. I also attach what some know of; the use of taxis to move me from other towns, from Sept last I have apparently moved via taxi from Burnley, Manchester, Salford and Blackpool and like the lowlife and their phones “behind me” the taxis and such like are all to be “behind my back” but often are not as I know now what the “signs” in such lunacy are. CC wide, I will print it off for banks and hand in when I next send my bank letters. Sorry I have no phone but personal callers welcome with full ID as I have full ID. to info, casework, hq1-profession., hq1-profession., dpd.imports, phishing, bae146, me, angelapowerba, secofstate, haveyoursay, chiefexecutive, chiefexecutive, policing.minis., fieldf, graham.farrant, lepforum, sajid.javid.mp, michael.lockwo., margot.james.mp, jake.diamont, homeaffcom, lotus.princess. From Ms Carol Woods 28 Fell View LA2 9RP.This data is of relevance to ALL copied: please feel free to quote me. 23 Oct 2008 and police officer TRACEY KENNEDY posed as me in Liverpool Magistrates Court on an “anti social behaviour” matter which led to the SEIZING, WRECKING AND LOOTING OF MY HOUSE 27 OCT 08 AND 19 NOV 08 WHERE SHE NOW LIVES WITH THE NOTICE TO QUIT SERVED IN MARCH THIS YEAR – AGAIN. That notice was sent out days ago to show what I deal with. THE COURT SERVICE HAS NOT ADDRESSED THAT TRAVESTY. Thus finding out about the FRAUD in Liverpool (not to mention others where she posed as me and as this goes to the Court Service with the information that CPS totally ignored this when I found out and reported it in July 2009*) and the Gestapo do nothing but wait for 23rd of EVERY MONTH of EVERY YEAR since to then hope to arrest me for “anti social acts”. In that they use the sleazy from the council (which liars, fraudsters, bullies and more object to being referred to as sleazy, well they would, wouldn’t they?) when “crime” cannot be manufactured. I attach an example here from RACHAEL HARLAND proven liar, gross unprofessional but only one found to be a liar at best (all evidence can be provided on request) and today? The loud mouth thief, fraudster and roughneck JUNE FRANCIS WILLIAMS in 30 Fell View who was provided with ID as if she was me ready for when I moved to 28 Fell View LA2 9RP on 24/3/14 (which is another act of lunacy, every 24th of every month of every year and at least 28 dates also of every month and every year, I apparently just move – again), with Williams the foul mouth common fishwife that she is given a voluntary post in HMYOI Lancaster Farms as if she was me: she has no qualifications so she could only be a volunteer which I found out with cogent evidence within days of moving to 28 Fell View. She was told to resign. The car she had then PK62 NXJ was a dark grey Peugeot registered to ME as if she was me. All that aside with their GAINS as Mr and Mrs Carl and Carol Woods, today AGAIN as I hung out washing she was to trying to provoke me (last evening’s farces had failed) to recreate the event as HARLAND here records as being what I said. The usual Masonic inversion lunacy sees ALL reversed so FACT becomes FICTION. I ignored her so there was no screeching of “my anti social behaviour”, (remember only 2 days ago they hid in 30 and pretending to be out, left open the ground floor window and judging me by their standards, hoped I would at least try to look in if not burgle them!) thus another “plan” was in full swing via the ILLEGAL GPS on my car. Which is in writing from the Gestapo as admitted ILLEGAL so I thank them for that. They use it to arrange such as this: they know where I park mostly when in Lancaster so have BT thugs waiting in hiding, apparently if I see a van then it is PROOF they have installed a phone line for me as WILLIAMS and at least 10 others use their phones as if it is MY use which is how they have gained so much in FRAUD and ID THEFT. I took a photo of the BT van sneaking away; it was 8 mins to 1pm and the INTENTION was seen as I walked from my car and found ANOTHER house in use as if I had gone to that house as a 2nd address (which is what O’Conner in 39 Fell View does as they have a 2nd address where they claim to be me as Woods – YOU fund that FRAUD), Woodville St, Moorlands area which now makes it apparently “proven” that I live in at least 35 houses in that small area as the Gestapo arranges this EVERY single time I park there, I spoil much by often moving my car but today I took photos and report this: DPD thug used many times in FRAUD and caught out with DPD Head Office informing me that the deliveries I have on film are not on their records but they have never asked me for photos. I send this to ALL banks on my next round of bank related mail outlining those who use MY name in FRAUD with banks having to be involved. I also add more from this malicious communication LIBEL of Harland, March this year listing her drivel as if REAL events. See item 13 taking photos of a neighbour with grand-children, no one has any, naturally Harland could not name the person when I asked. Then item 14 which is more drivel as the item at 1. This was why they sent the fat loud foul mouth in NY54 RZN car to race round and round and screech into her phone and they all pretended she was me thus all this is not LIBEL! Next to the house on Woodville St which was 33 yesterday as I parked near to that but today it is another, a lower even number, DPD started to make a delivery, apparently I had arrived to take delivery. A car with the usual scum waited MA63 WWK looked like Chevrolet, silver grey who were to pretend to have dropped me off. All on camera, I left them to their delusions. Earlier as I left 28 the Gestapo had been waiting and hiding AE17 car used often, that idiot had driven all the way to Caton AT YOUR EXPENSE to then say he saw me leave Caton (I returned to see what he INTENDED to do and saw he drove round and off wasting police time), as he was to witness me leaving Fell View and thus was PROOF I went to yet another address on Woodville St again and not the one used yesterday. Photos from today not developed yet obviously. 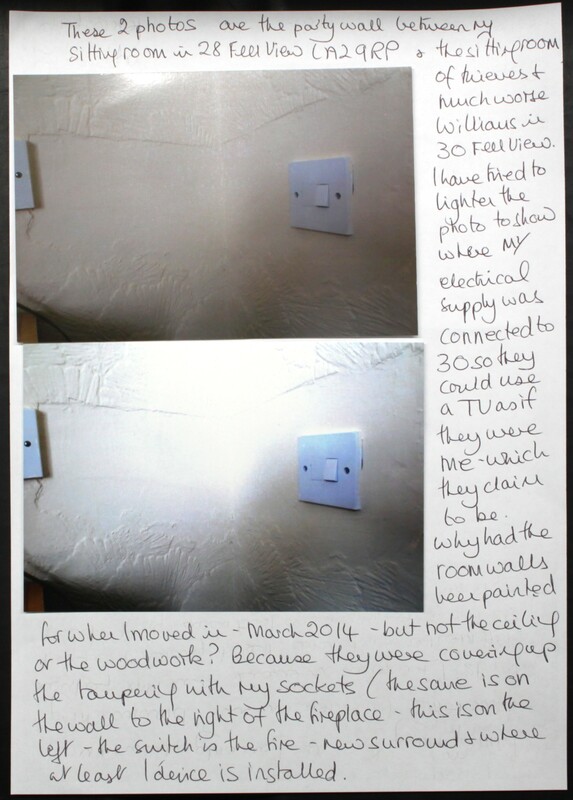 I also attach the photos of BT and the ILLEGAL WIRING installed in 28 Fell View so that the E-CRIME and COMPUTER MISUSE could be ORGANISED, and a letter the council sleazy sent to me manufacturing as fact that I had a mobile phone when they had used unemployed roughneck Woodruff AGAIN from 2 Fell View, she in 45 Fell View and hanging out of the window using her phone 6/12/17 pretending to be me making a call; that halfwit thought if she hung out far enough it would be proof the phone call was seen as being from me in 28! To then cover for this FRAUD the council sent Mr Sleazy to hide at the rear of the bungalows 32/30/28 and take a photo from my garden using his phone to claim that the photo was on a phone I used. His problem was that I caught him skulking and reported him; ignored of course. This also to BT. It has taken me years to find an email contact given I am not a customer but now I have this so banks at least can check. *CPS informs me that they have to have a file from police before they can act on anything so, there you have it, CORRUPTION and more. Ends Carol Woods PS the other “inconvenient fact” to spoil all that? After taking my photos and walking to the town, I saw my grand-daughter in town and while the Gestapo provide bogus relatives for the lowlife trying to give them my family make-up, I have REAL family. Thus the Mrs Carole Woods they try to INVENT me as being yet again to cover thuggery of YEARS failed. I will check the electoral register and see who is registered at the 2 addresses I appear to live in as part time tenant asap. One address I checked which the Gestapo used I found was a named person which name was one from my case which case led to the murder of Mike Todd GMP: a GLADSTONE, that was the CHILD STEALING part of my whistle-blowing 2001. TREASON HAS TO BE INVOLVED WITH MAIL DELIVERED IN FRAUD AND FORGERY OF MY SIGNATURE. I hope you all remember my email of yesterday with the bent cop waiting to say he saw me near a post box while a scruffy male posted but that was to be ME “SEEN” so “proof” I posted something. I sent out emails earlier and found the usual when leaving the library (I have no private facility) which was the local lowlife sent to rush in and hope to use the terminal I used which somehow makes them into me or to pretend I SHARE a computer! Outside the Gestapo had an AGNES JACKSON type sitting to be SEEN and “reading a book” (looking at pages) which is because I read a lot so, she has to have lookalikes to seem to do that as then she is me where I am. This is how the Gestapo waste THEIR TIME and YOUR FUNDS, they had to find ANOTHER they thought could be seen to be Jackson thief and fraudster and thus was me in the library seen just outside. I took a photo, she was about 10 years too young to be Jackson and grey haired, so that rules me out, I am younger than Jackson and do not have grey hair at all so, no “confusion”. This is AIDING AND ABETTING a criminal, Criminal Law Act 1967 Sec 4(1) (I think). Thus I returned later to send this. Attached is a set of others all stalking me to be seen where I was so that Jackson could be said to be me. I attach the page of Gestapo thuggery where Jackson had ready installed in 26 Fell View for my move to 28 (on 24/3/14) ILLEGAL DEVICES which she used POSING AS ME in 28. I found out after a few months (it even included a TV set linked to my loft so that I would be charged with viewing without a licence – I have no TV( Williams in 30 have a TV SKY IN MY NAME as they are also apparently me) , I keep my mains of for at least 23 hours a dayand switching off at the mains in Aug 2014 when I knew they were up to no good found panic and much banging on walls in 26 decommissioning the devices with the Gestapo then calling to collect them. This is what the council bullying trolls NOW want to claim is my ANTI SOCIAL BEHAVIOUR IN BANGING ON WALLS. The car identifies this thug. 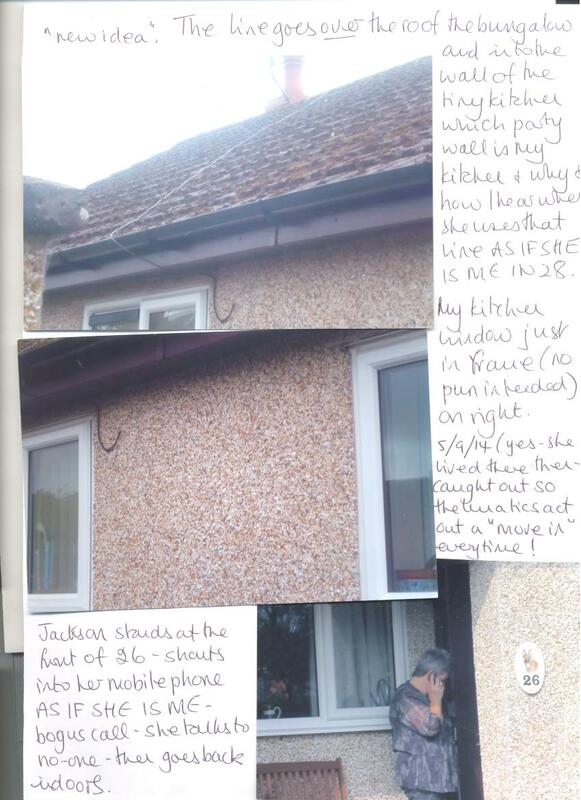 The other page is BT installing a second phone line in 26 via the rear as the deranged Jackson pretends that her rear door is one of her and her front is another) her identical twin in fact – me apparently). I have no phone at all, no TV and really with all the lowlife posing as me with their phones and TV I seem not to need anything. 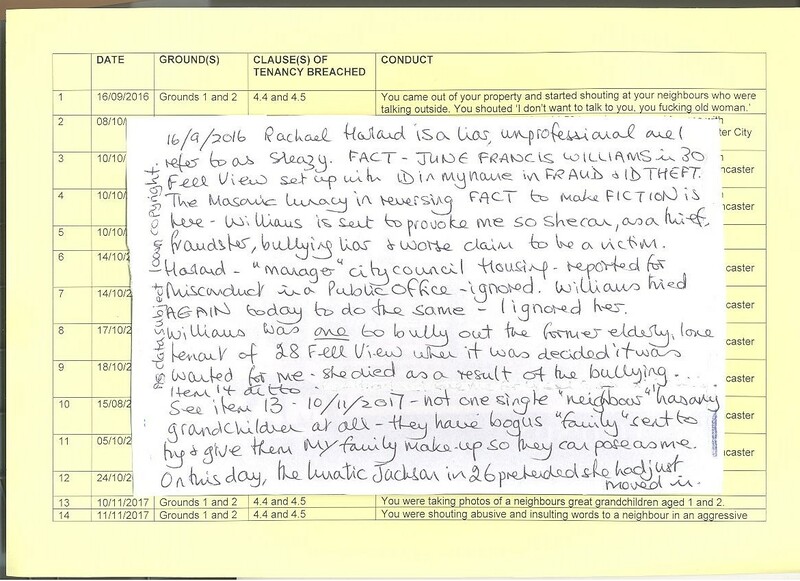 Carol Woods Ms (The council will not like my referral to council tax; I will be punished by reprisals to protect that old thief and worse in 26 Fell View LA2 9RP. Dear Sirs Council tax I have referred 20, 45 and 13 Fell view for having lodgers who are involved in FRAUD using MY name. They have all gone now (for now at least) but can I add the thief and fraudster K MILLS in 7 Leslie Ave sister to K Mills in 20 Fell View and use of the fat foul mouthed troll in NY54 RZN who is PRETENDING TO BE ME and using her phone as me in that! That foul mouth has “moved” her business away from 20 Fell View KARLEY MILLS aka STAIG with intent to defraud, and now KIRSTY MILLS is “housing” her. The car DK06 WDC a silver grey is one also the same using Leslie Ave number 5 and or 7 at least and ANOTHER unemployed lowlife to stalk and harass and pretend she is either linked to me or is me. 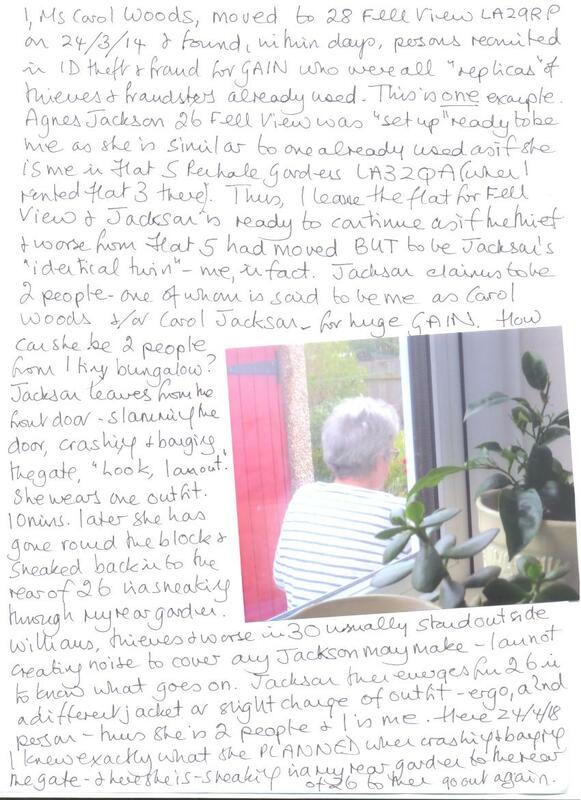 I also note again that AGNES JACKSON in 26 Fell View is there alone; she does not have an identical twin called Carol Woods or Carol Jackson, she is another fraudster and thief, send her a council tax bill for her “twin” and see what she does! Yours etc Carol Woods Ms I hope this helps. Sorry I have no phone.